Herodias warst du, und was noch? First she-devil! Rose of Hades! Herodias were you, and what else? Come here! Come here now, Kundry! 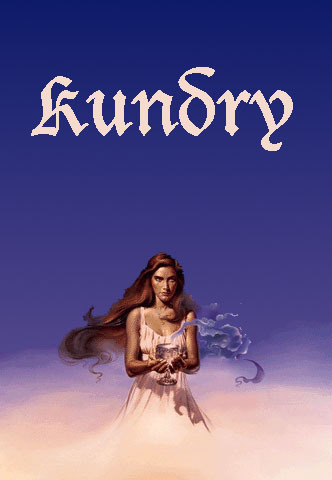 In Wagner's last music-drama Parsifal, we encounter a mysterious creature called Kundry. In the domain of the Grail, this Kundry appears as a wild woman, an unkempt, shabby and repulsive crone. On the other side of the mountains, however, in the magic garden of the sorcerer Klingsor, she appears as a beautiful maiden. In this article, I shall try to identify the many elements that were combined to create the most complex character in all of Wagner's dramatic works. Further articles will explore some of these elements in detail. 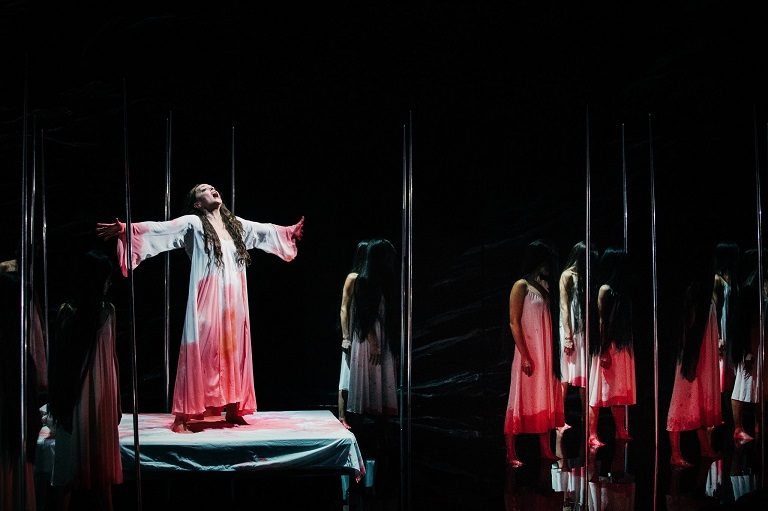 Above: Evelyn Herlitzius as Kundry in the recent NY Met production of 'Parsifal'. At the end of Act II, Kundry curses Parsifal to wander. agner's Kundry can be related to several female characters who appear in his Percevalian sources; although it is important to appreciate that Wagner also added elements from completely different literary and mythical traditions; notably, the exotic Herodias. The Percevalian sources included, as I have described in a separate article, Wolfram's Parzival, Chrétien's Perceval and the anonymous Welsh/Breton Peredur. In addition, Wagner, in the late 1860's, had a copy of Perlesvaus, or The High History of The Holy Grail, although it has not been established that he knew this book before writing the Prose Draft of 1865. Right: A dark-skinned Condrie abuses Parzival in this painting from Ludwig's castle of Neuschwanstein. ne of the archetypes of this tradition that caught Wagner's imagination was that of the Loathly Damsel. This creature appears at critical points in all four of these poems. Generally she brings news (in German, "news" or "information" is Kunde, whence Kundry), explains what has happened, and hints at what might happen later. Wolfram presents Condrie la sorziere as the High Messenger of the Grail. In Perlesvaus, perhaps taking a hint from an unimportant line in Chrétien's poem, she becomes the Bald Damsel, who is also lady Fortune. In Wolfram it is Sigune who becomes bald. ne element, found only in the Welsh/Breton Peredur and in the allegorical Perlesvaus, seems to have been particularly important for Wagner: the repulsive, filthy Loathly Damsel is also the beautiful Grail Bearer who is seen at the Grail Castle. This dual nature of the character as she appears in these two poems, is also found in other medieval literature, notably in Chaucer's Wife of Bath's Tale. Wagner kept this element of duality; although in his version, it is Condrie la sorziere who is seen at the Grail Castle, and her beautiful transformation is controlled by Klingsor. Here Klingsor seems to be based on Wolfram's Clinschor who has cast a spell over the proud and beautiful Orgeluse. olfram's account of the first visit of the sheltered youth to the Grail Castle was based upon an earlier version of this incident in the poem by Chrétien (summary). 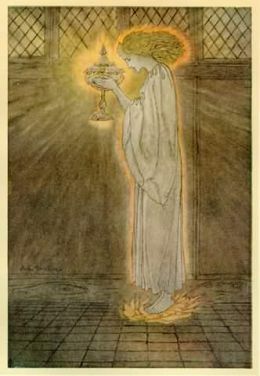 Left: The Grail bearer as portrayed by Arthur Rackham. any things are unclear in Chrétien's account, not least the phenomena seen by Perceval at the Grail Castle, including the beautiful maiden who bears the Grail. The poet died leaving his poem for others to complete, which they did in various ways (the so-called Continuations). As in the modern detective story, we can see that Chrétien was building up to an ending in which these mysteries would be explained both to the young hero and to the reader (as they are explained by the hermit in Wolfram's completion of the story). hrétien does not explicitly state that the Grail was the source of the food that was served to Perceval and the others present in the hall; although the passage has often been read that way, and later authors developed the horn of plenty aspect of the Grail. Perhaps the original of this Grail was a Celtic vessel that provided limitless food, such as that from which, in an Irish tale, the daughter of Lugh fed Conn? or is it clear whether the radiance that appears when the Grail enters emanates from the cup itself or from the girl who bears it. It is possible that the original Grail Bearer was a goddess and it might be that, through misreading of this passage, the divinity had been transferred from the girl to the vessel itself. The remaining question is: which goddess? Right: Waltraud Meier as Kundry, Bayreuth 1989.
oomis believed that he had found the origin of the Loathly Damsel in Celtic tales 1. He pointed out similarities between her description as found in the Welsh text of Peredur and Irish adventures, suggesting that the Loathly Damsel is one aspect of the Sovereignty of Ireland, who may be identified with the goddess Eriu. Her role in the myth of Irish kingship is to personify the land; her metamorphosis from hag to beautiful maiden represented the change from winter to spring, when vegetation appears out of the dead land. In order to win her, the aspiring king must embrace her winter aspect, and marry her in the spring to ensure the fertility of the land. This is one version of the myth of the Waste Land. It is in her winter aspect that Eriu appears in the story of Niall, and it is in her spring aspect that she appears in the tale of Conn, in which she offers the hero drink from a golden cup. 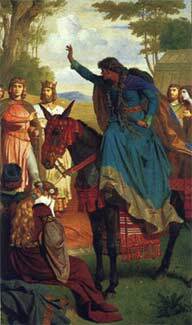 he story of Perceval is the story of Conn reversed: Perceval fails the test. Instead of the Loathly Damsel becoming a beautiful goddess, the beautiful girl becomes an ugly creature who pours scorn on the Quester for his failure. It is possible to see traces of this myth in Wagner's Parsifal: Kundry's kiss; the arrival of the hero at the edge of the forest as winter changes to spring; Kundry's assistance in the anointing of Parsifal as king. 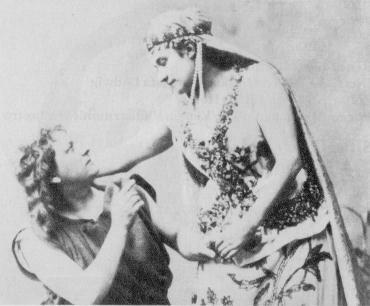 Left: Winkelmann as Parsifal and Materna as Kundry, Bayreuth 1882. ©Richard- Wagner- Gedenkstätte. agner's dramatic genius can be seen in his ability to select from sources and to make new connections between their elements. Drawing on diverse sources, Wagner made some radical changes to Wolfram's story, simplifying the plot and reducing many simple characters to a few complex ones. agner adopted the Christianised version of the Grail, rather than the mysterious stone described in Wolfram's account. By 1865 he had discarded the Question entirely; after considering several alternatives, he made the recovery of the spear the focus of the story, removed Gawain and his quest, and later changed some of the names (although the names in the Prose Draft are still those taken from Wolfram). Wagner merged two of Wolfram's characters to make a composite called Gurnemanz, and merged at least three of the female characters into a composite called Kundry. He linked together the Grail, the spear and the wild woman: when Titurel arrived in the mountains with the holy relics, he found Kundry: Der fand, als er die Burg dort baute, sie schlafend hier im Waldgestrüpp, erstarrt, leblos, wie tot . Right: Kundry asleep, from H.J. Syberberg's film. © Artificial Eye. Celle qu'un sang farouche et et radieux arrose! n her Cambridge Handbook, Lucy Beckett entirely misses the point of the Herodias reference, but makes an interesting observation about the reference to Mary Magdalen. 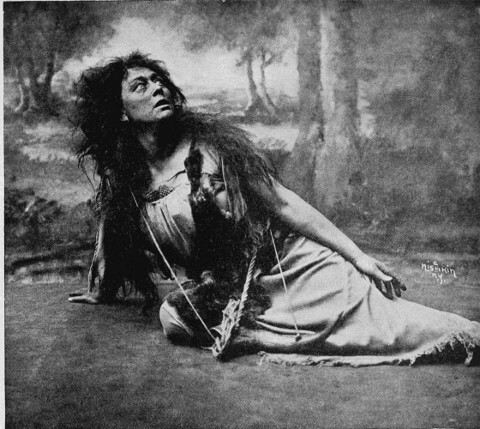 Beckett reminds us that in 1848 Wagner had sketched a scenario for a play called Jesus of Nazareth, which includes a scene in which the penitent Magdalen kneels in repentance before Jesus on the shore of Lake Gennesareth; later in the play she was to anoint his head and wash his feet, just as Kundry does toward Parsifal in the opera. Although Wagner repeatedly denied that Parsifal was a Christ- figure ( I never gave the Saviour a thought , he said), this image had stayed with him and was incorporated by him into the Good Friday scene. n Die Sieger, an opera that Wagner never completed, a chaste young man called Ananda receives into the religious community a beautiful girl called Prakriti, who has passionately loved him; but Shakyamuni, the future Buddha persuades him to renounce her. The Buddha reveals that in an earlier incarnation, Prakriti had rejected, with mocking laughter, the love of a young man. Prakriti is a parallel to Mary Magdalen in the sense that both are outcasts. By absorbing these two outcast women, in their different ways excluded and despised by patriarchal societies, who by their associations with the Buddha and Christ respectively introduce further religious iconography to Wagner's drama, Kundry gained a further dimension. Left: Cartoon by M. Kringle, in Klier, 1985. 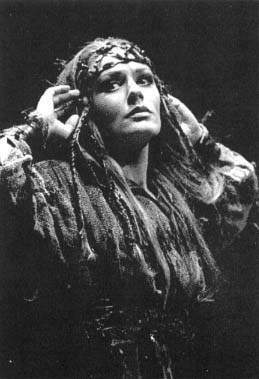 Below: Waltraud Meier as Kundry in each of the 3 acts of Parsifal. he last word in this introductory article (more can be found by clicking on the hand icon, above) shall belong to Claude Lévi-Strauss, whose essay From Chrétien de Troyes to Richard Wagner (in The View From Afar) provoked me to look more closely at the origins of Kundry. We may ask ... whether Wagner, by making Kundry a double creature, was not unconsciously going back to a very ancient tradition, of which only a vestige survives in Wolfram. Celtic literature sometimes describes an old, repulsive hag who offers herself to the hero and then, when he accepts her, turns into a radiant beauty - an image, we are told, of the sovereignty that a pretender to the throne must win. Furthermore, in order to construct the character of Kundry, Wagner blended into one, four heroines of Chrétien and Wolfram: the 'hideous damsel' already mentioned; the Maiden-who-never-laughs, except to tell Perceval of his promised destiny [Wolfram's Cunneware]; the cousin [Wolfram's Sigune] who tells him that his mother is dead and who, in Wolfram, is the first to call him by his name; and the 'wicked maiden' ... Orgeluse. According to Wolfram [she is] indirectly responsible for the treacherous blow that strikes Anfortas down. Footnote 1: Here it should be noted that Wagner's main source of Celtic legends was a Breton collection that included the Peredur. His Bayreuth library contains some volumes of Erin, a collection of Irish folktales and legends in German translation. Footnote 2: In the 1865 Prose Draft Wagner writes of an ancient curse without stating why Kundry had been cursed. Only in the second Prose Draft of 1877, after Wagner had been reading books about early Christianity, did he introduce the idea that Kundry had mocked Jesus and that he had cursed her; so that she now seeks Christ from world to world, endlos durch das Dasein quält .